RAF bomber command raid interpretation report No. K.3926. Covers the period 22nd February 1945 to 15th March 1945 for attacks by the USAAF 8th Air Force (08/03/45) and the RAF (10/03/45) on the synthetic oil plant at Gelsenkirchen/Scholven, Germany. Three foolscap sheets detail the damage caused by the raids and evidence of any reconstruction afterwards. Another 'supplement' sheet notes that the plant was completely inactive with no repairs or clearance seen. Information from 'The Bomber Command War Diaries' states that 155 Lancasters of 3 group carried out the attack (10/03/45) and photo reconnaissance (13 Squadron) showed this to have been very accurate and effective. The paperwork is dog-eared/creased with small tears, annotations etc. 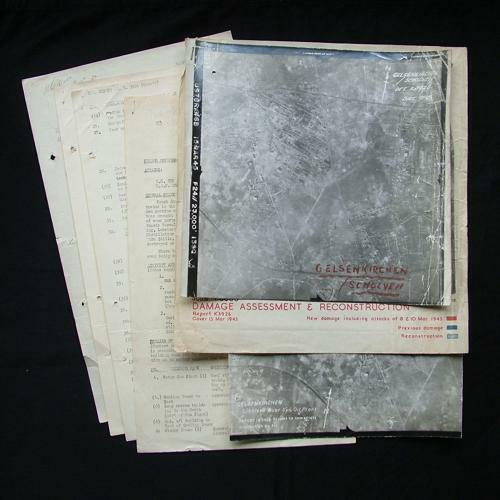 Interesting original documents relating to 8th AAF and bomber command sorties over Germany during the last months of the war. Stock code P22873-96.